I've always had the best intentions when it comes to baking. Infact I'll go as far to say that some of my ideas are quite good. 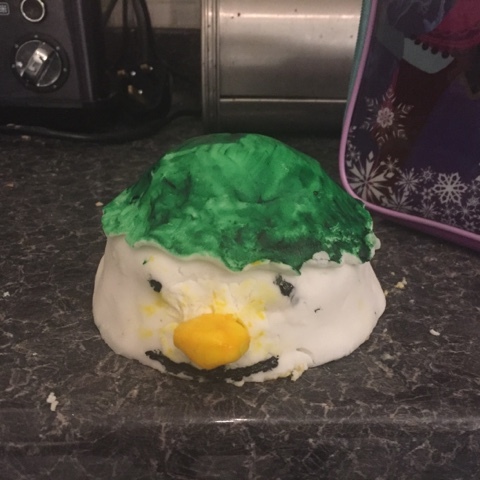 However what is pictured in my head doesn't always come look the same in reality, this can definitely be said for my latest attempt, a Christmas cake. In my head I envisioned a small cake that in the end would turn out to look like The Snowman. I bet there are loads of you thinking well that's easy, how could that possibly go wrong? One word, icing! 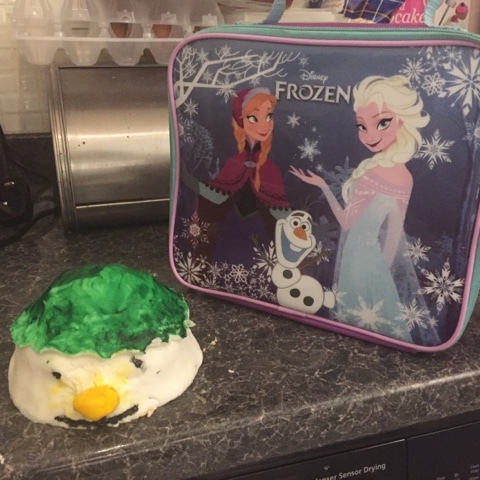 The icing just didn't want to play ball so my poor snowman ended up looking a little "messed up" I suppose is the polite way to put it or sh*t.
You can make out above what I was aiming for and I popped the sponge against Gracie's lunch box so you could get an idea of the size of it. 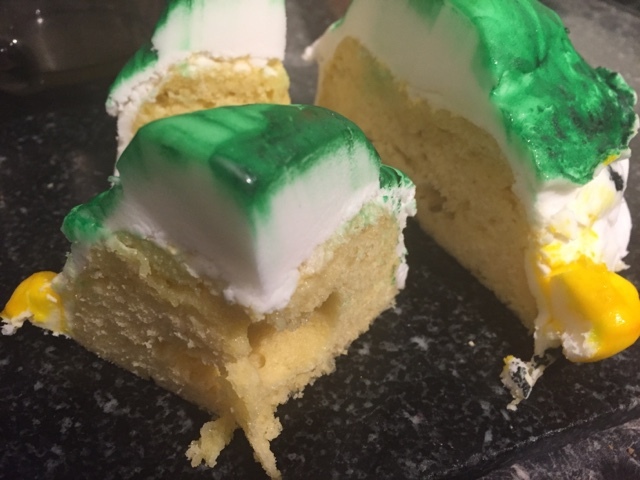 As bad as it is I will share with you the cake recipe as the cake itself was actually rather scrummy, no I'm not blowing my own trumpet, my lovely kids say so and they are the type to be brutally honest when it comes to all things mum makes. * You can cream the butter and sugar together first but if you are feeling lazy simply pop all of the ingredients into a bowl and mix until they form a nice smooth mixture. * Pour into a pudding bowl, you know the ones used for Christmas pudding and cook in the microwave for 3 - 3 and a 1/2 minutes on full power. Now you can adapt this sponge by adding things like nuts, fruit or perhaps chocolate chips but as I was decorating it I decided to keep it plain. These are so quick and easy to make, it makes the ideal pudding for when you need one fast! I could still make out that it's a Snowman! And I bet it tastes yum! And that's most important! Ok...I did laugh, sorry. It's still a very good attempt in my book! Ha ha :) ah it happens, but at least it tasted nice which is the most important thing! Will try the recipe, never made a microwave cake before. still looks good, and recognisable. As long as it is edible then family do not expect perfection. I am like you, can see it in my head but the ,message does not get to my fingers to well. I heard about this pudding but never do it by myself making it!